Inspired after witnessing the parade and pageantry that commences Munich’s Oktoberfest, Mayor Henry Maier envisioned something similar to kick off Milwaukee’s festival season. 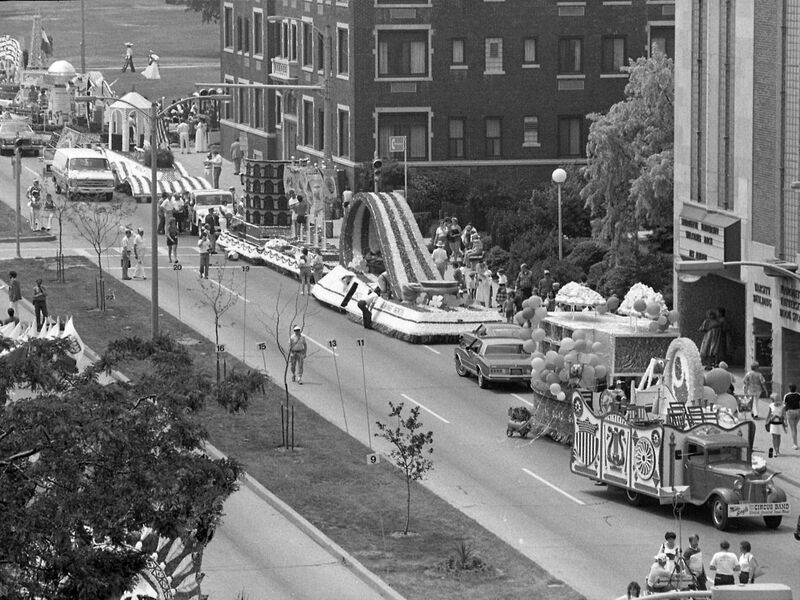 Beginning in 1983, the City of Festivals Parade opened Milwaukee’s summer festivals and celebrated the city’s ethnic diversity. Every June, high school bands and floats featuring ethnic dances and musicians wound their way through downtown Milwaukee. The two-mile route began at Tenth Street and continued mostly along East Wisconsin Avenue all the way to the lakefront. The parade proved popular, with estimates placing at least several hundred thousand spectators along with parade route in 1985. While attendance remained impressive throughout its run, financial support from local corporations severely declined and the city chose to cancel the parade after the 1993 event. ^ Thomas Heinen, “Astronauts to Highlight City of Festivals Parade,” The Milwaukee Journal, February 27, 1984, accessed February 10, 2014, http://news.google.com/newspapers?nid=1499&dat=19840227&id=HnEaAAAAIBAJ&sjid=ACoEAAAAIBAJ&pg=2132,4767689. ^ Maralyn A. Wellauer-Lenius, Images of America: Swiss in Greater Milwaukee (Charleston: Arcadia 2010), 118; Thor Christensen, “Summerfest May Cut up Festivals Parade,” The Milwaukee Journal, September 16, 1993, accessed February 5 2015, http://news.google.com/newspapers?nid=1499&dat=19930916&id=tqIaAAAAIBAJ&sjid=wiwEAAAAIBAJ&pg=5470,708983; The parade’s organizers, led by Robert Doucette (who served as Grand Marshall and was president of Milwaukee Insurance), had no experience putting on such an endeavor. They visited the Rose Bowl and Indianapolis 500 parades to gather information and ideas. For more on this see Jay Joslyn, “They Love a Parade, and Preparing One for City of Festivals,” The Milwaukee Sentinel, May 14, 1985, accessed February 5, 2015, http://news.google.com/newspapers?nid=1368&dat=19850514&id=yohQAAAAIBAJ&sjid=ZxIEAAAAIBAJ&pg=3745,4710114. ^ “A Step by Step Guide to the City of Festivals Parade,” The Milwaukee Journal, June 16, 1985, accessed February 10, 2015, http://news.google.com/newspapers?nid=1499&dat=19850615&id=sWoaAAAAIBAJ&sjid=TioEAAAAIBAJ&pg=7125,4549618; for the 1989 lineup, see “City of Festivals Parade Lineup,” The Milwaukee Sentinel, June 23, 1989, accessed February 10, 2015, http://news.google.com/newspapers?nid=1368&dat=19890623&id=eXYxAAAAIBAJ&sjid=phIEAAAAIBAJ&pg=4632,6369394. ^ “City of Festivals Parade Switches to Planning for 1986;” Common Council President John R. Kalwitz estimated several hundred thousand attended in 1986, while Police Department estimates put the number closer to 500,000, see Bruce Gill, “Kalwitz Challenges Crowd Estimate for Parade,” The Milwaukee Sentinel, June 25, 1986, accessed February 25, 2015, http://news.google.com/newspapers?id=6qpRAAAAIBAJ&sjid=sBIEAAAAIBAJ&pg=1286%2C1678239. ^ Jackie Loohauis, “City’s Great Promoter,” Milwaukee Journal Sentinel, February 3, 2001, accessed February 15, 2015, http://news.google.com/newspapers?nid=1683&dat=20010203&id=2bMaAAAAIBAJ&sjid=ojAEAAAAIBAJ&pg=6881,2050343; “Change Needn’t Kill the Parade,” The Milwaukee Journal, September 18, 1993, accessed February 15, 2015, http://news.google.com/newspapers?nid=1499&dat=19930918&id=uKIaAAAAIBAJ&sjid=wiwEAAAAIBAJ&pg=4692,1923170. For budget cuts that began in 1988, see Bruce Gill, “Summerfest Budget Cuts $57,000 from City of Festivals Parade fund,” The Milwaukee Sentinel, December 11, 1987, accessed February 14, 2015, http://news.google.com/newspapers?nid=1368&dat=19871211&id=cYhQAAAAIBAJ&sjid=oxIEAAAAIBAJ&pg=2651,2368573.